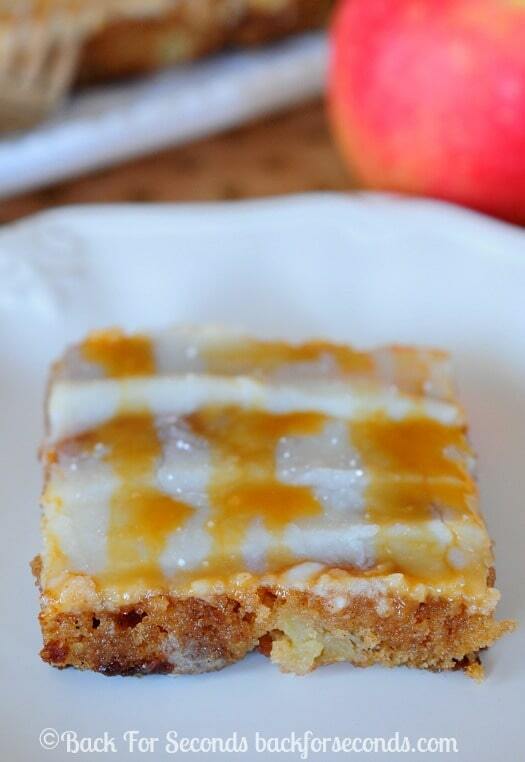 Caramel Apple Texas Sheet Cake is incredibly moist and flavorful. It’s easy to make and feeds a crowd. The caramel cream cheese icing is out of this world! Never miss a recipe – follow Back For Seconds on Bloglovin or subscribe to my mailing list (top of the page)! Do you ever make sheet cakes? They are awesome because they’re so easy – no need to worry about decorating or making them look perfect, and they feed a crowd, so they’re great for holidays and parties. 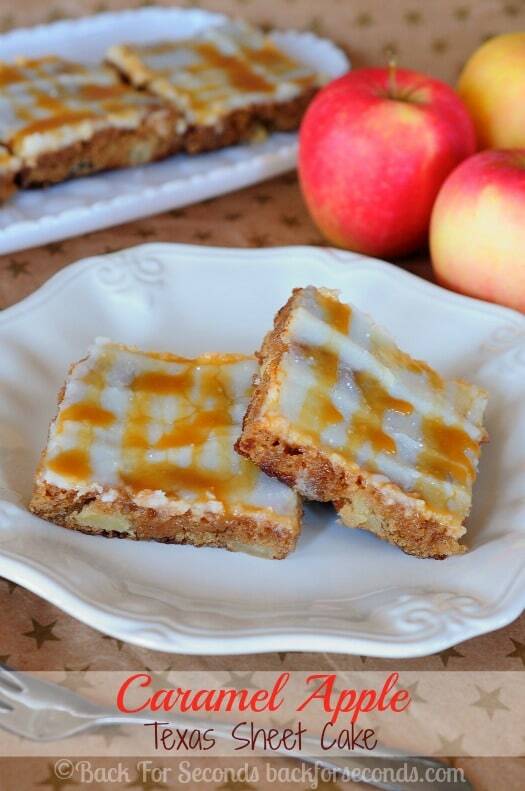 This Caramel Apple Sheet Cake is ridiculous. I couldn’t stay out of it! I kept sneaking a piece for breakfast…and then again with my afternoon coffee. You must try this cake – but be warned, it’s irresistible! This cake has been put on the “make again and again” list. The cake itself is so moist and full of apples and cinnamon spice. But the icing puts this cake over the top. 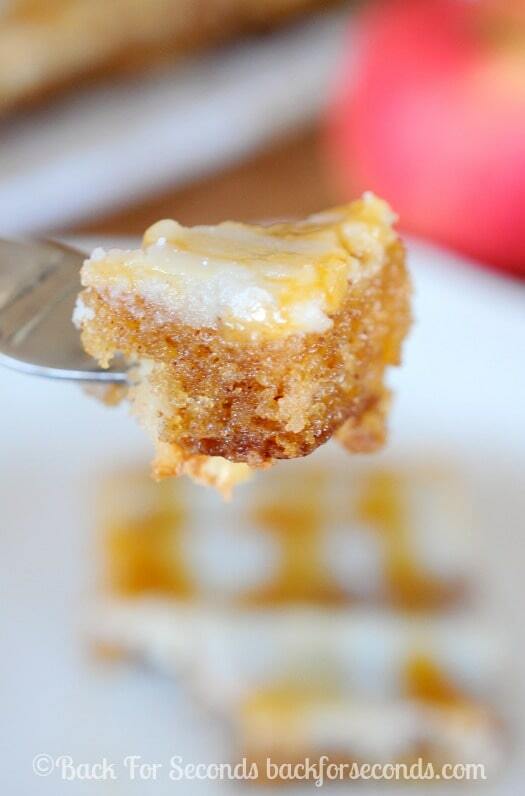 It’s basically a cooked cream cheese frosting drizzled with caramel. You pour the icing on the cake while it’s hot, and when it cools, the icing develops a bit of a “shell” but underneath it’s all gooey and fabulous. Are you hungry yet? I just talked myself into making (and eating) another cake! Be sure to scroll to the top of the page and sign up to receive new recipes for free via email!